This August a group of walkers spotted a rare white hummingbird in the Million Ranch development of South Fork. 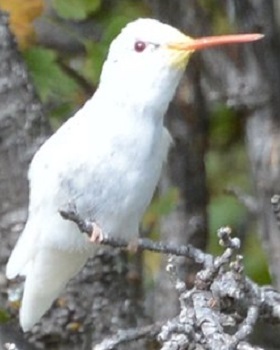 This turned out to be the first true albino hummingbird photographed in Colorado. Local resident Kim Krahn first spotted the unusual bird on a morning walk around 8 a.m. Monday, August 25. She pointed it out to her husband Ken as well as fellow walkers Don and Betty Law of Balko, Oklahoma. At around 9 a.m., Don and Betty’s grandson, Jarret Kachel, took multiple pictures of the bird. Ken Trahn tried to get his own pictures later that night.